THE Rail Delivery Group has warned that there are ‘no winners’ in the disputes between the RMT and train operators over on-train staffing. More strikes have now been called which are set to disrupt Northern services on every Saturday for the rest of the year, including those in the Christmas shopping period. On South Western Railway, strikes have been called for 17 and 24 November, which are also Saturdays. Another walkout planned for 10 November has been cancelled by the RMT. The union gave no reason for suspending this strike, but it would have affected train services on the day before Remembrance Sunday. 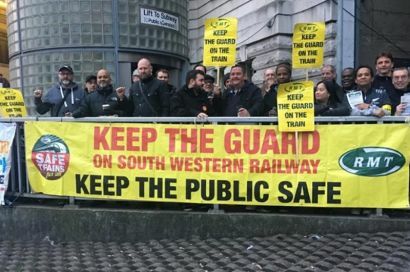 The operators, the RDG and other industry bodies continue to maintain that a traditional guard is not necessary to maintain safety on all trains, pointing to fully driver-only operated systems such as London Underground and Thameslink.